Steve Roach’s artistic medium is sound. Every true artist finds their original voice in their tone. 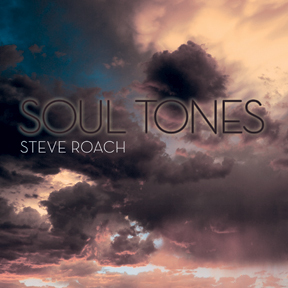 Through Steve’s innate sense of rich tonal color and complex harmonic creation comes his unique signature voice. From the inside – outwards, this quality is his inherent soul tone. Over the span of several decades the tone has evolved and yet feels connected to a constant source. This sonic genesis is one of the original promises of electronic music in Steve’s hands. It is fully alive and present on all of his releases. His signature voice is one of creating hand-made sounds from which the music emerges. Soul Tones is an evolving expression of expansive breath. Rich color blends into into dark space. Massive sheets of harmonic meditations filter down to the edge of silence. Like a visual painter, Steve chooses his musical spaces as his canvas and blends his sounds – his paints – to connect to a higher need. Soul Tones is the wing of the gallery where pieces like A Deeper Silence, Afterlight, and “Piece of Infinity” would be found. Like all of his long-form pieces, Steve lives the music – playing it and listening to it many hours of the day and night – shaping it into its mercurial form over months or even longer. This release is the first of a three CD series, each disk arriving about four months apart. This offers a different perspective: inner-connected pieces with space and time between each. It encourages full absorption by the listener. Flow States is the second part of the series and is scheduled to be released on Projekt in the spring of 2013. The third part will be released a few months later.